TabCloud is a Chrome extension and Android app which allows you to save open Chrome windows and restore them on another computer or at a later date. After being thoroughly disappointed by a talk from Mozilla labs about Weave (now called Sync) at last years FOSDEM (they appeared to have made very little progress in the last 3 years, and were not even planning to offer any kind of real-time synchronisation). I had decided to attempt to implement the open window/tab synchronisation feature for Google Chrome as an extension. At the time I planned to host the server for this using node.js and allow real-time synchronisation with changes automatically affecting any machines you currently had connected. After quickly writing a solution using websockets it became obvious this was a harder problem than I anticipated – synchronisation is hard, mainly when things go wrong, i.e. how do you deal with conflicts when multiple machines have flakey connections, also the Chrome extension API makes it very difficult to distinguish the difference between closing all a windows tabs, and closing the window – so the project in that form was abandoned until I could find more time for it. Fast-forward to the summer and I am working at IBM as a technical intern for Extreme Blue, I have a work laptop, home computer and my personal laptop, I am still using Chrome as my main browser and I would really like a way of sharing my browser sessions between my machines. I had recently created LinkPush (something I intend to blog about shortly), which made me think of using Google App Engine to host a simplified session sharing plugin for Chrome using Google Accounts as a means of secure identification. 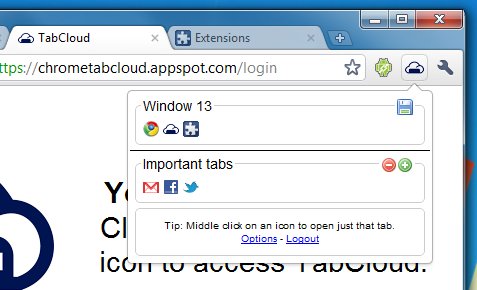 The result – TabCloud – is an extension which allows you to save an open window as a group of tabs, which can be restored on any other computer (or the same computer at a later date) via the extension interface. It also offers some other features such as naming windows, and re-arranging tabs between open windows and saved sessions by dragging and dropping the tab icons. I also released a very simple Android app which allows you to view your saved tabs as a list from your phone and open any individual link. The project isn’t really anything like my original plans, however I find it extremely useful, hopefully at some point I will find the time to make a truely real-time session synchronisation app (unless Google beat me to it). Firefox 4 beta comes with the current Mozilla Sync (also available as an extension for older Firefoxes), which periodically saves all your open tabs (as well as other data) to their server, which allows you to view open tabs on one machine from another (or mobile device), however (despite this being more what I originally aimed for) this seems a lot less useful in practice than the simpler functionality I have implemented with TabCloud. If you are interested the whole project is open source and available on GitHub.